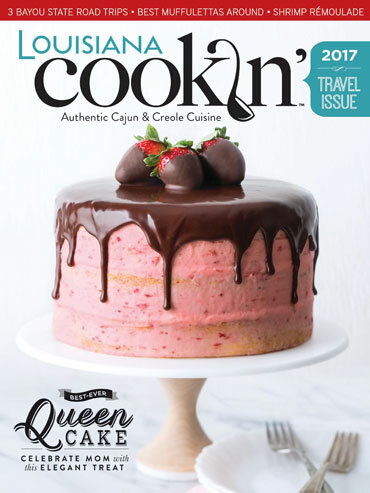 We were planning a special issue of Louisiana Cookin’ and we thought of a beautiful way to honor our mothers—a Queen Cake!! My mom always made marvelous cakes when we were growing up. It was always a treat to smell the aroma coming from the kitchen. So in honor of our moms, we created a cake just for them. 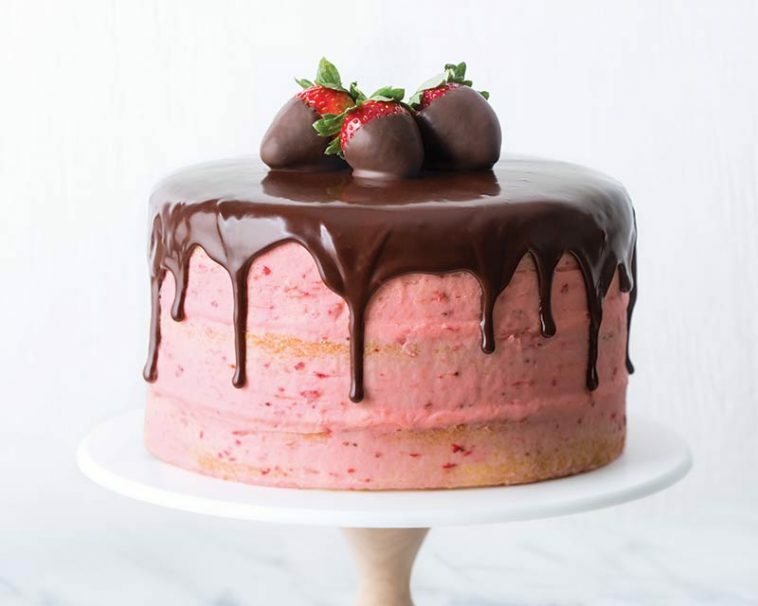 The Louisiana Cookin’s luscious, show-stopping layer delight combines tender almond cake, ripe spring strawberries, and a decadent buttercream frosting. We can never thank our mothers enough, but this cake is certainly a good start. Each year their May/June issue showcases an updated version of their coined ‘queen cake’, and this year’s cake is just marvelous. There is nothing quite like the gift of a homemade dessert! Thank you to our wonderful mothers for loving us, bringing joy and laughter to our lives, and for being there for all the moments in our lives! Preheat oven to 350°. Spray 3 (8-inch) round cake pans with baking spray with flour; line pans with parchment paper. In a large bowl, beat 1 cup butter and granulated sugar with a mixer at medium speed until fluffy, 3 to 4 minutes, stopping to scrape sides of bowl. Add eggs, one at a time, beating well after each addition. In a medium bowl, whisk together flour and baking powder. Gradually add flour mixture to butter mixture alternately with milk, beginning and ending with flour mixture, beating just until combined after each addition. Beat in extracts. Pour batter into prepared pans, and smooth tops. Bake until a wooden pick inserted in center comes out clean, about 22 minutes. Let cool in pans for 10 minutes. Remove from pans, and let cool completely on wire racks. In the work bowl of a food processor, place strawberries; pulse until smooth. In the bowl of a stand mixer fitted with the paddle attachment, beat salt and remaining ½ cup butter at medium speed until creamy. Reduce mixer speed to low. Gradually add confectioners’ sugar, beating until smooth. Add strawberry purée and 1 tablespoon preserves, beating until combined. Transfer to a pastry bag fitted with a ½-inch tip. Pipe a ring of frosting around inside edge of bottom cake layer to create a border. Fill center with ½ cup preserves. Repeat with second cake layer and remaining ½ cup preserves. Top with remaining cake layer. Evenly spread the frosting on top and sides of cake. Scrape sides of cake with a spatula to remove excess frosting to achieve the “naked” cake look. Refrigerate for at least 4 hours. In a small microwave-safe bowl, microwave cream on medium until steaming, about 1 minute. Stir in chocolate morsels. Let cool for 10 minutes. Starting in center of cake, pour chocolate, working clockwise to outside edge. (You may have some leftover.) Refrigerate for at least 1 hour. Garnish with Chocolate-Covered Strawberries, if desired. How perfect. I’ve been looking for a pink cake to serve at a ladies luncheon. My plan is for pink, white and green decor and I’d love to match the food as well. For example, salmon filets on a bed of microgreens. This cake will be just the thing especially if I make several tiny cakes to send home in white boxes with green polka dot ribbons. Thanks again for your lovely style. Happy Mother’s Day to all! Love the cake and will bake it soon! The cake is lovely! Thank you for the recipe. Thank you so much. This cake is a marvelous dessert!!! I hope you have a beautiful weekend too. Happy Mothers day.That cake is fit for any queen. Happy Mother’s Day, Phyllis, and all my RibbonFriends. May God Bless each of you!! thank you so much. Blessing on you and yours. I love Mother’s Day. Thank you so much. I hope you have a blessed day as well. Thank you Robina….I hope you have a blessed day too.